Rongbuk Monastery is a Tibetan Buddhism Temple located in Tingri County to the southwest of Shigatse city. 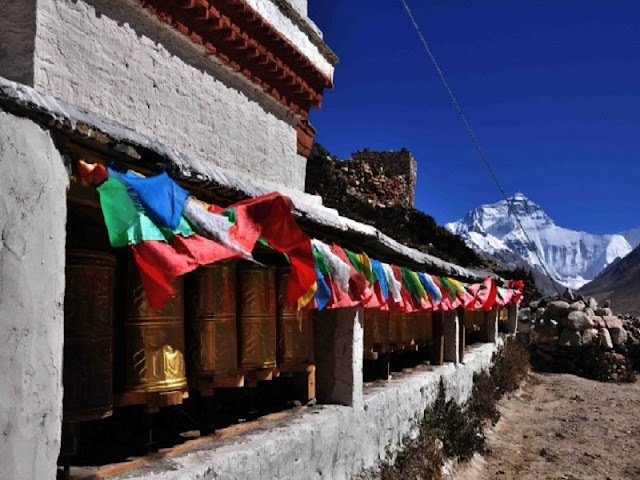 As the highest monastery around the world, the old temple lies on a mountain top near Mount Everest with an elevation of 4980 meters. Founded in 1902, Rongbuk Monastery is an important temple for Nyingma sect (also called Red sect of Lamaism) in Tibetan Buddhism. It was known as the “sanctuary of the birds” because any destruction of life is strictly prohibited in this area. The British came there in 1921 found that the animals near the temple were very tame, sometimes wild animals even would come to the monastery fearlessly. 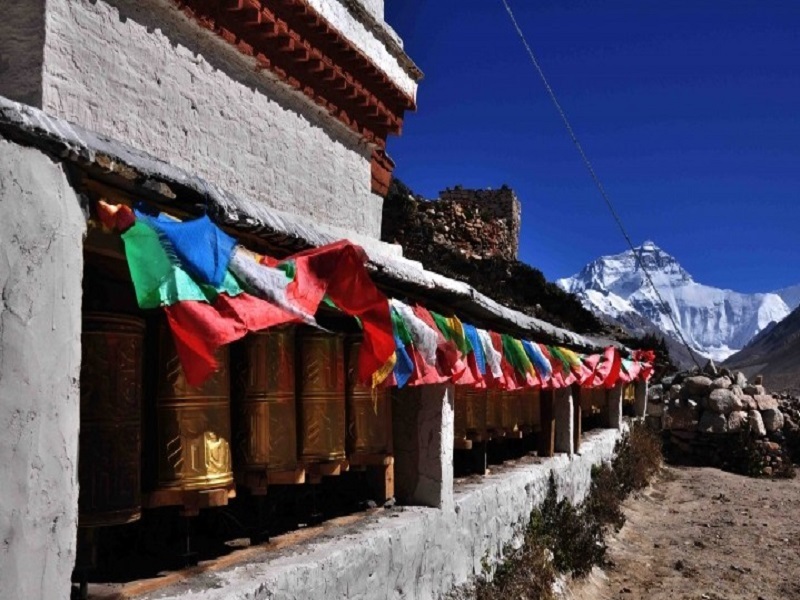 Surrounded by mountains, Rongbuk Monastery is an ancient architectural complex with some five-storey buildings. It’s said that the reason why the temple was founded in a place so high is for the peaceful environment there. Rongbuk Monastery is a unique temple where monks and nuns live together peacefully. In the golden age, up to more than 300 monks and 300 nuns practiced Dharma there. Sakyamuni Buddha and Guru Rinpoche statues have been placed for worship in the main hall of Rongbuk Monastery. The Mani stones below the white pagoda outside the temple is an altar where the local Buddhists pray for good luck. 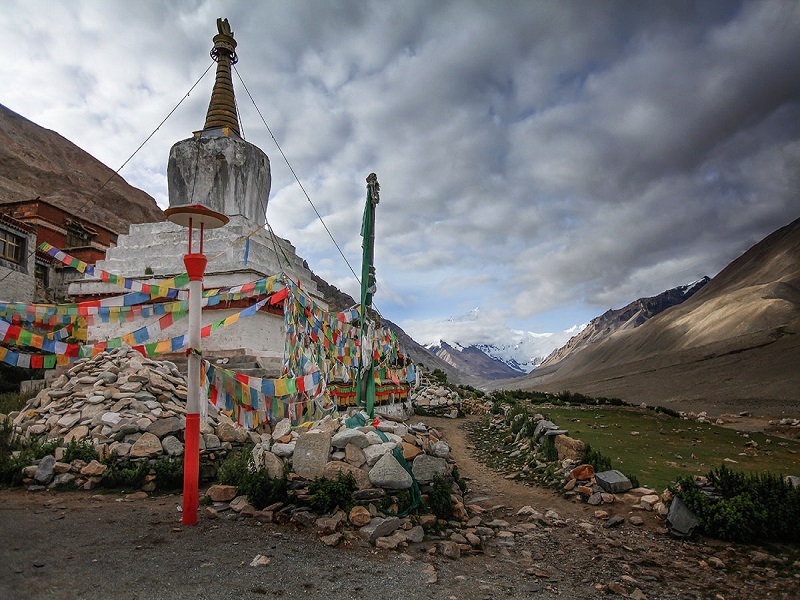 Rongbuk Monastery was an important site of pilgrimage in the past. Hundreds of Buddhists and yogis practiced meditation in the huts and caves of this area since the 18th century. 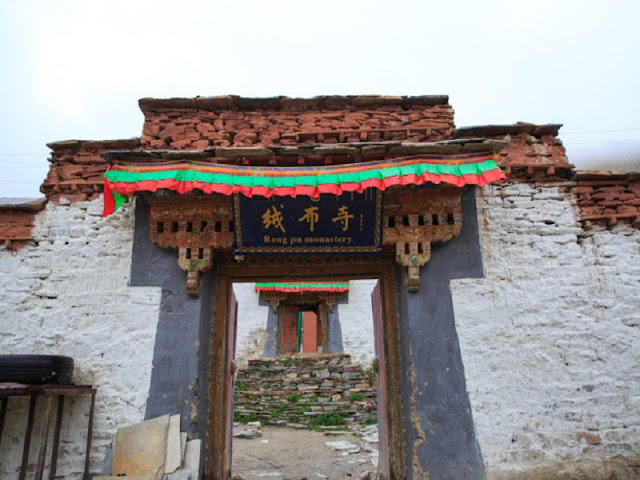 Today a meditation cave where Guru Rinpoche once practiced Dharma still remains, this made the ancient temple a holy place for pilgrims. The monastery was badly destroyed in the 1960s. A serious of rehabilitation work has been carried out in the following decades and the old temple was reborn, along with a stupa outstanding in landscape photography of this area. There are many excellent murals in Rongbuk Monastery. Along with the large Chorten, the unique architectural there makes a fantastic photograph with Mount Everest tower into the clouds. 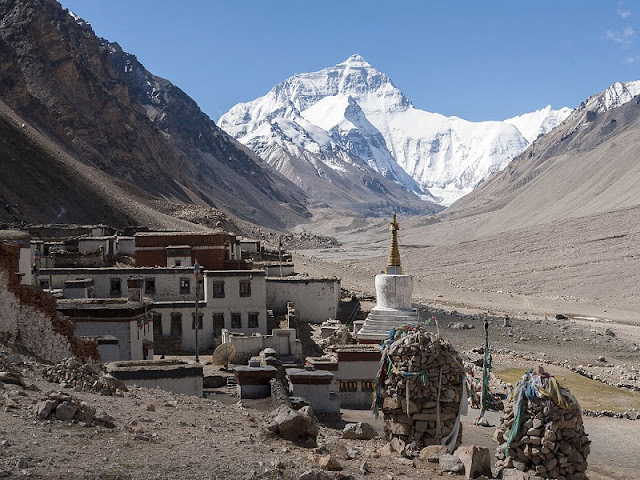 Rongbuk Monastery is the base camp for the adventurers who want an ascent of Mount Everest from the north side and a site for the travelers who want on a Lhasa Everest Base Camp Tour. It’s the best place to enjoy the beauty of the world's highest peak. 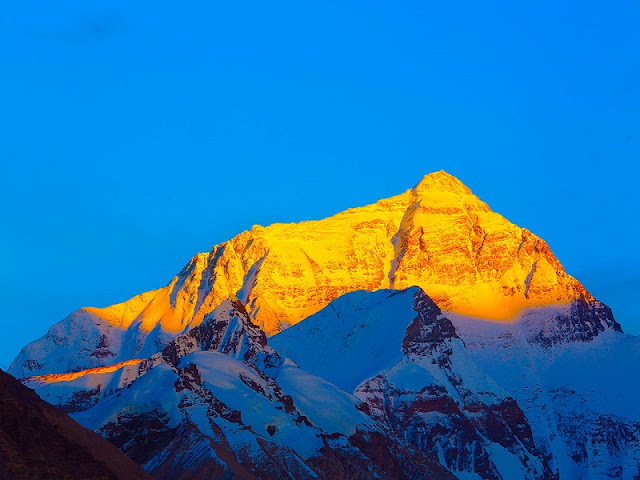 Take a distant view to the south, Mount Everest stands majestically among the mountains like a giant pyramid. On sunny days, an ivory-white cloud can be found on the top of Mount Everest like a white flag, this is a spectacular sight which called the highest flag-shaped cloud in the world. 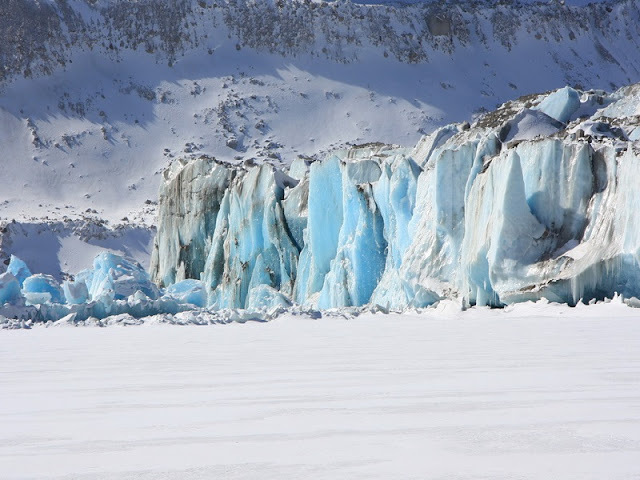 Walking forward from Rongbuk Monastery, you will find the famous Rongbuk Glacier which is the largest glacier among the countless glaciers formed around Mount Everest. With an area of 86.89 Square kilometers, this great glacier is a beautiful place where various of gorgeous ice towers, ice bridges, and icicles could be seen. 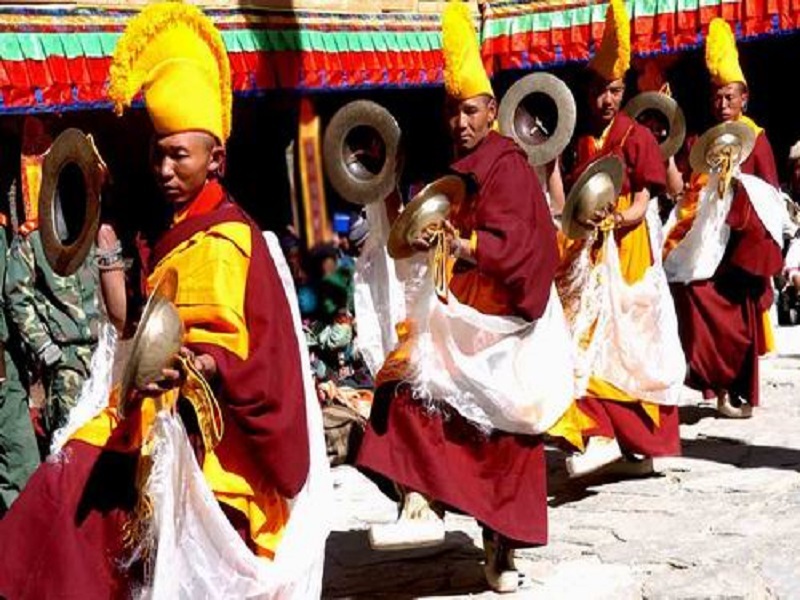 From 15th April of the Tibetan calendar, a three-day seance will be held in Rongbuk Monastery to celebrate the birth, enlightenment, and the Parinirvana of Sakyamuni, which is also known as Saga Dawa Festival.